Search for a debug menu. Wouldn't be out of place for a Camelot game. There are lots of what seem to be debugging-related strings loaded into memory during gameplay. Song ID 02 is an arrangement of the Marion Club theme from Mario Golf: Advance Tour. Song ID 03 is an unknown track. Song ID 23 is another unknown track. Song ID 25 is an uptempo, subtly more percussive version of the first phrase of the title screen music. Given that it is one of the two tracks in the game that don't loop - with the other one being the ending theme - it might have been intended to be used in an alternative ending of some sort. 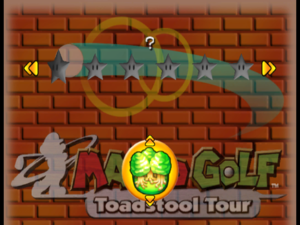 Forcing the Ring Attack hole selection menu out of bounds past Bowser Badlands makes it present Congo Canopy like any other course, with an icon and holes of its own. However, no ring location data or unique strings seem to be left, as previewing the first hole merely loads data (sans the name of the hole, which is always shown as ?) from the previous hole previewed in the menu and scrolling to another softlocks the game. When the placeholder hole is selected, the player as well as the cup are often spawned out of bounds. The game does seem to load some of the Congo-specific data correctly, as its flag graphic is displayed where it usually would (in the top left corner of the screen, for example). Curiously enough, the course's own music as heard in other gamemodes is played instead of the Ring Attack-specific track that plays on all other courses. Should the player manage to complete the glitched hole selected, the game will hang after the character's celebration animation. As 24 "?" strings are present in the RAM right after the hole names for Bowser Badlands, it is likely that at least some and at most 18 of these are dummied-out names for the holes on Congo Canopy. Find out if any of these have graphics and functionality left. Add the Japanese, French, German, Italian, and Spanish strings. Both kinds of bridges do appear in the final game, but their lies are simply indicated as "Rock" and "Wood" respectively. This one is technically not unused, but to see it under normal conditions the ball has to lie right against the stem of a mushroom. As the game was first in North America, its versions in other regions of the world were subjected to further refinements, primarily in gameplay and graphics. In Japan, the game is known as Mario Golf: Family Tour (マリオゴルフ ファミリーツアー Mario Gorufu Famirī Tsuā). This is reflected in the opening and ending cutscenes, as well as the title screen. As with most other Nintendo games in the region, the PAL version has additional language options in French, German, Italian, and Spanish. Ball in-flight trails were made much shorter in length. Most full-power shot particle effects were toned down as well, excluding those of Mario, Bowser, Shadow Mario, and Bowser Jr. The Japanese and European versions measure putting distances and wind speed in meters and meters per second instead of feet and miles per hour, respectively. In the American release, hole-in-ones on par 4 and par 5 holes are announced as albatrosses. This was fixed in the later two versions. Various fonts were changed, including the ones used for the "PAR" indicator at the upper left corner of the screen in gameplay and the post-shot distance/lie description. The text colors for messages like "Nice shot! ", "Excellent! ", and so on were revised. Various menu transitions were made much quicker, most notably when opening the pause menu and moving on to the scoreboard from the character celebration animation. Spin fire and the ball skipping over the hole were given new sounds. Computer-controlled characters are much quicker to calculate their shots and cycle through clubs faster. In the PAL version, Shadow Mario has proper taunts instead of repeated full stops. In the American version, beat every Star Tournament once with every non-Star character. This makes for a total of 102 Star Tournaments to be won! No wonder this was toned down in future versions. In the Japanese version, beat Bowser in his Character Match. 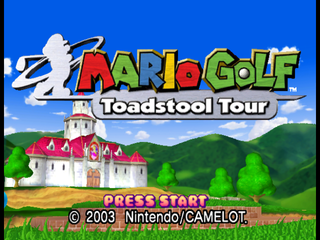 In the PAL version, win the Bowser Star Championship. voiceUnload called when no voices were loaded! courseConstSFXInit called without freeing last one! playSong called with invalid songnumber. crossfade called with invalid songnumber. These sound-related strings are among the first ones loaded. This page was last modified on 31 July 2018, at 03:20.